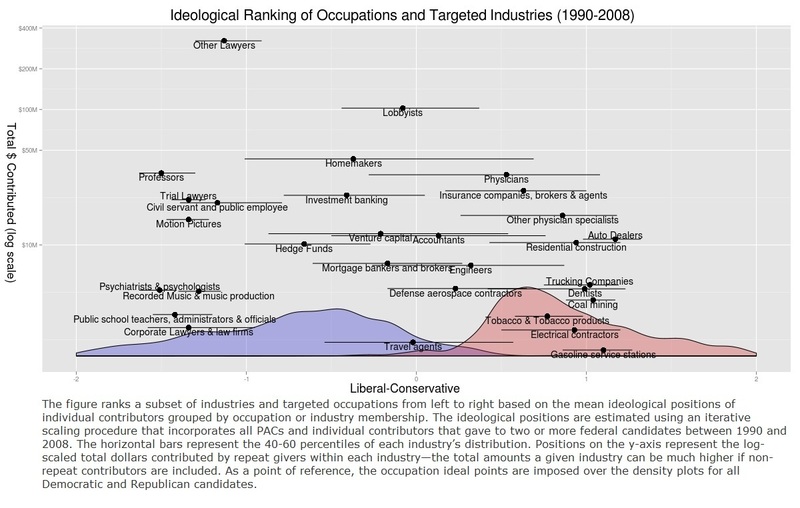 A bunch of charts breaking down occupations by ideology are flying across the Internet at the moment. Perhaps Robin Hanson started it? (Linked by Cowan here.) Hanson includes a link to this NYT article, which focuses upon the Left-orientation of tertiary education, but that’s a huge, perennial topic in itself. Pretty consistently bi-modal, bears out MM’s ‘Two Americas’ thesis quite well. It would have been interesting to see statistics (using a different methodology, of course) for healthcare and the military, and whether these align as extremely to the left (former) and right (latter) as I suspect they do. If you look at the website healthcare is there. It’s actually extremely bi-modal but parsed out further mental health is very left, nursing slightly left, physicians right, and surgeons very right. I didn’t see anything there for the military but from other sources the higher the rank the more right they become (Though I suspect chiefs would be more right than lieutenants). I was impressed that the automotive sector was very right but disheartened that even Boeing leans left and Raytheon was in the middle. I thought mainstays of the MIC would be more right. I remember when they used to try and tell us, “America is a centre-right country.” Obviously not. To the content of the chart, it’s important to point out that the 3rd estate’s elites, the bankers, donate the most on a centre-Left position. They know the path to “leadership” in the Cathedral and are after such notereity.